The language of symbols develops when an attempt is made to represent something that is beyond the normal capacity of the human mind to understand. A transcendent reality is expressed in terms of equivalents known as symbols. To represent a group in terms of quantity we use symbols called numbers. To represent ideas in terms of sound we use symbols known as words. To transmit words to others in a graphic manner we use the symbols of letters of the alphabet. A symbol can be natural or conventional. When we perceive a direct relationship between one order of things with another a natural symbol develops. In the Agamic cosmology symbolism is the expression of reality. It is the expression of the particular points where two worlds meet. The meeting points of the transcendental world with the material universe. The material world is a reflection of the transcendental world and therefore true symbolism springs from nature and is not invented by mankind. However far back we reach in Indian thought as a whole we find a coherent use of symbols to represent abstractions. The whole of Indian iconography is built up upon a code of symbols based on the assumption that there exists a natural affinity between ideas and forms. This code of symbols has come down from time out of mind, its origins are lost in the remote ages of prehistoric man. Symbols do not speak to the rational mind and cannot be fully understood by logic, they are the subject of inner experience and spiritual realization. Symbols are the inner language of the unconscious mind. In the Spiritual Realm (Parama Vyoman) God resides in the form of Para-Vāsudeva. He is adorned with the nine chief ornaments and weapons which represent the various cosmic principles of the universe. 3. Gadā (mace) — mahat (cosmic intelligence). These weapons and ornaments are not regarded as mere symbols but are actually connected with the principles which they represent as the presiding deities. The ultimate Reality in the Pañcarātra doctrines is Brahman characterised by bliss and devoid of all negative qualities. The word Brahman is derived from the root bṛh which means "to expand" or "to grow" and as such indicates the "immensity" which denotes all the manifestations of God in the Transcendental as well as the functional aspects. This Immensity is beyond comprehension and expression, out of this transcendental Being there issues forth the first form of God known as the Para-Vāsudeva in a subtle form with two arms, crystal in complexion and clad in yellow garments. This is identified also as Nārāyaṇa. The Pañcarātra does not support the theory of “two Brahmans” of Advaita Vedanta, where the Unmanifest Nirguṇā Brahman is superior to the Manifest saguṇa Brahman; the latter being enveloped and conditioned by Avidya (nescience)! Everything connected with the icon has a symbolic meaning: the posture, gestures, ornaments, number of arms, weapons, vehicle, consorts and associate deities (Parivāra devatā). These descriptions and interpretations are found in the Śrīmad Bhāgavatam, Vishnu Purāṇa, Gopala-uttara-tapini Upanishad, Kṛṣṇā Upanishad, Agamas as well as in the Brāhmaṇas and Āraṇyakas. This symbolizes the state of undifferentiated unity of Prākriti (primordial matter) prior to creation of the universe. From liquid milk solid butter is churned — from the undifferentiated Prakriti differentiated solid matter arises. The Kṣīra-Sāgara stands for the pure unadulterated state when the three guṇas [the three cosmic forces; (rajas) centrifugal force — expansion, (tamas) centripetal force — contraction and (sattva) centralizing or harmonizing force] exist in perfect harmony and balance. When this balance is disturbed then the competing forces give rise to the creation of matter in it’s five states – solid (earth), liquid (water), gaseous (air), heat (fire) and expansion (space). It also represents the consciousness, in the myth dealing with the churning of the ocean of milk we have the symbol of churning the mind through devotion in order to produce the essence (butter) in the form of God Consciousness. During this process the 14 jewels are extracted. The ocean is also symbolic of the space or ether or infinity, and Vishnu is identified with the sun whose function of creation, preservation and destruction in our solar system is identical to that of the Supreme Lord in the entire universe. Ananta Śeṣa is the name of the serpent with a thousand heads upon which Vishnu reclines. The serpent in non-different from Vishnu Himself. The word Ananta means the endless or infinite, and Śeṣa means the 'remnant' or 'residue'. When creation is withdrawn it cannot entirely cease to be, there must remain a germ in subtle form of all that has been and will be so that the world can be re-projected when the time comes. It is this remainder of the universe that is embodied by Ananta Śeṣa floating upon the limitless ocean of the causal waters and forming the couch upon which Vishnu rests. Another meaning of the term śeṣa is 'servant' or Subordinate and the master is known as śeṣi or the Principle. Vishnu is always represented as being dark blue or black in colour. Darkness is the colour of the limitless and all-pervading ether. The very name Vishnu means 'the all- pervader' and so the colour reinforces this idea of the Infinite, Beyond limitation and the basis of all spatial manifestation. Black is in fact not a colour it is the sum total of all colours. So too Lord Vishnu is the sum total of the entire cosmos and all its particles. In the Golden age in which the cohesive- tendency (sattva) predominates, the Lord appears in a white form. In the second age in which the expansive-tendency (rajas) predominates, he appears as red in colour, in the third age in which there is a mixture of rajas and tamas, His colour is yellow and in the age of kali in which the disintegrating-tendency (tamas) prevails, his colour is black. (Brahma Purāṇa 246). The four arms represent the three fundamental qualities (guṇas) and the notion of individuality (ahaṁkāra) [from which all existence arises]. Four is the number of the earth, and represents the fulfilment of manifestations in all the spheres of existence. a. The cardinal directions; indicating that the Lord is all pervading and has perfect dominion over all the directions. b. The Yajña kuṇḍa (fire pit); the Lord is known as Yajña Purusha, he is the sole enjoyer of the sacrifices as well as being the sacrifice itself, and as such his arms represent the four Vedic kuṇḍas (Gārhapatya, Āhavanīya, Āvasathya, Sabhya). c. The four Vedas which are the sacred Revelation namely Rik, Yajus, Sāma and Atharvana. d. The four divisions of society; intellectuals, administrators, entrepreneurs, and workers. e. The four stages of life; student, householder, retirement and renunciate. f. The four levels of consciousness; waking (jāgrat), dream (svapna), sub- consciousness (suṣupti) and transcendental consciousness (turīya). g. The four types of devotees; distressed, inquirer, the opportunist and the sage. h. The four functional manifestations (Vyūhas). Vāsudeva, Aniruddha, Pradyumna, Sankarṣaṇa. i. The four essential components of dharma; truth (satya), austerity (tapa), compassion (dayā), and charity (Dāna). j. The four aims of human endeavour (puruṣārthas); pleasure (kāma), prosperity (artha), righteousness (dharma) and liberation (mokṣa). k. The four types of liberation (mukti), communion (sāyujya), association (sārūpya), contiguity (sāmīpya), collocation (sālokya). l. The four ages of man - (yugas) Satya, Trētā, Dvāpara, Kāli. m. four types of birth — gods (deva), humans (Manuṣya), animals (tiryaka) and plants (sthāvara). n. The four types of Spiritual Paths or Yogas:— jñāna, karma, bhakti and śaraṇāgati. o. The four types of differentiation among all existing things — genus (jāti), form (rūpa), nature (svabhāva) and knowledge (jñāna). p. The four qualities of all manifested beings category (jāti), attributes (guṇa), function (kriyā), relationship (saṁbandha). 2. sarveśvaratva Supreme Lordship and Dominion over the entire creation. 3. sarva-antaryāmitva inner rulership and control of all entities. 4. sarva-karaṇatva Supreme Cause of all causes. 5. sarva-niyantṛitva Supreme controller of everything. 6. sarva-kartṛitva the original Performer of all actions. 8. sva-tantratva complete and absolute independence. The conch represents the first manifestation of articulate language — AUM— nāda Brāhman. This monosyllable contains within itself all language and meaning in a potential state. It is the seed from which speech developed — the nutshell containing the whole of knowledge and wisdom. All matter is light and vibration. All the forms of the universe are effects of the primeval sonic vibration. Thus the conch is the symbol of the origin of existence. Its shape is a spiral, starting at one point and evolving into ever increasing spheres. It comes from water, the first compact element. When blown it produces the sound AUM. The conch is named pañcajanya which means 'born-of-five' and it is the representation of the pure-notion-of-individuality, (Sāttvika ahaṁkāra), from which are evolved the principles of the five elements. (Padma Purāṇa 4;79;222). According to the Vedic account of creation, in the beginning Brahman (the Supreme Being) alone existed then a desire arose to create the first ego-sense arose within Him, and from this primeval ego-sense gradually the process of creation was set into motion. During war in ancient India the conch was blown to signal the commencement of the battle, it was also blown by the victorious parties to announce their victory. The Lord's blowing of the conch therefore indicates that He is always ready to do battle with the forces of evil and for the protection of the devotees. The Cosmic Mind has the unlimited power which creates and destroys all spheres of existence (lokas) and forms of the universe, the nature of which is to revolve. In the beginning the Lord said to Himself eko'ham bahu syam — “I am one, may I become many”. And thus He projected the manifold universe that we see around us. There is only one centre to the wheel but it is said to have a thousand spokes (sahasrāra). The Discus is called Sudarśana which means 'pleasing-to- see’; it is usually shown in iconography with a hexagon in the centre. The six points of the two triangles represent the six seasons in a yearly time cycle, in the centre nave is the seed sound (bīja) 'Hrīm', which represents the changeless, motionless centre, the Supreme Cause. The interlocking triangles symbolise the union of the male and female elements of the Universe (puruṣa = prakṛti). The Wheel has eight spokes and 8 wings, which represent the eight syllables of the sacred Aṣṭākṣarī mantra, while the outer circle of the wheel represents 'māyā', the divine power of manifestation. In the microcosm the Universal Mind corresponds to the active-notion-of-individual- existence (rajas ahaṁkāra) that is associated with the fiery principle. "The prodigious power of the mind can destroy all forms of ignorance, hence the discus is the fearful weapon which cuts off the heads of all the demons of error ". (Śrī Vishnu tattva siddhānta 5;19 44-45). The lotus represents the manifested universe, the flower that unfolds in all its glory from the formless and infinite waters of causality. The pure and unsullied lotus arising from the depth of the waters and far from the shore is associated with the idea of purity and with sattva which arises from the law-of-conduct (dharma) and knowledge (jñāna). It rises in the mud of material existence gradually growing through the waters until it reaches the surface and then opens up to the sun in all its glory. Water splashed upon a lotus leaf never remains but immediately slips off. In the same way the dirt of worldliness never stain the enlightened being. The mace is the form of strength or power and the intellect is the highest power, by the power of mind one person can control thousands. The mace is thus the symbol of the intellect (buddhi) or the power of knowledge. It is called Kaumodakī which means the-stupifier-of-the-mind. The power of knowledge is the essence-of-life (prāṇa tattva) from which all physical and mental powers come. Nothing else can conquer time and itself become the power of time. The mace can also be interpreted as representing the Law of Karma and the nigraha śakti — the power of justice of the Divine. The Sword represents Pure Knowledge (jñāna) whose substance is wisdom (vidyā) — It is called nandaka which means the ‘source-of-joy.’ This flaming sword is the powerful weapon which destroys ignorance. The sheath represents nescience (avidya) which is the fundamental problem of human existence — ignorance not of data and science but of who we really are in essence — pure conscious entities (jīvas) having a human experience. The bow is the destructive aspect of the-notion-of-individuality (tāmasa ahaṁkāra). This aspect is associated in the creation of the world with the disintegrating tendency and with the origin of the iṅdriyas (sensory and motor faculties) and their fields of activity in the material world. This activity of engaging in sense gratification is symbolized by the arrows, held within the quiver which is the storehouse of actions. The arrows are then shot at objects within the field of our daily experience. On the path to enlightenment the bow represents the psychological foundation from which spiritual unfoldment takes place. The arrow of the mind is aimed at its target which is the Supreme Lord, and then with skilful means of spiritual techniques it is released to fly to its ultimate goal and never to return. Upon the chest of Lord Vishnu there is a priceless gem called Kaustubha which means treasure-of-the-ocean. This total consciousness which is the "World-Soul" known in Vedānta as Hiraṇyagarbha (golden matrix) pure, subtle and unstained is the chest-jewel named Kaustubha. This gem is comprised of the totality of the consciousness of all living beings, born from the causal ocean, and it is the enjoyer of material creation. On Vishnu’s chest there is a small spiral mark (sometimes a small triangle) called Śrīvatsa which means beloved-of-Fortune (Lakṣmī). This represents Primordial Nature (prakṛti) — the First Principle of Manifestation or the material energy which is the source of the natural world. This is the symbol of all that is enjoyed: the multi-fold beings and forms of the manifested world. The three leaves represent the three guṇas or qualities of matter — active (rajas), passive (tamas) or balanced (sattva). The garland made of five types of forest flowers (or five jewels) is called the Vaijayantī mālā the garland-of-victory. It symbolizes the five spheres of the senses, the display of manifestation which surrounds the Supreme Being. Yellow which is the colour of the fire represents yajña or Sacrifice which is the principle activity taught in the Vedas. The Lord is known as yajña-puruṣa the One who receives all the oblations offered into the sacred fire. The act of creation is depicted in the Vedas as a cosmic sacrifice in which the Supreme Person Himself becomes the victim, and it is from this primeval sacrifice that the cosmos has its origins. In order to receive we must give, obtaining one thing also requires letting go of another. This ethically managed reciprocity is the foundation of Dharma practice. The sacred thread (yajñopavitam) symbolizes the syllable AUM, by its three strands. (S.B. 12.11.;2). All initiated members of the 3 twice-born castes wear the sacred thread draped over the left shoulder and falling upon the right hip. It indicates that the one who wears it is committed to the control of body, speech and mind. The fly-whisk of Vishnu is the Eternal-law (Sanātana dharma), the life-breath of the universe which arises at the first moment of manifestation. (Kṛṣṇa Upaniṣad 20). The two ceremonial whisks held on either side represent Dharma and Glory. Cāmaras or fly-whisks are the symbol of royalty in Hindu society and are only used by members of the high estate. The parasol which is the emblem of Sovereignty, carried over the heads of Kings and high dignitaries on festive occasions represents the Supreme Abode of Vishnu; Land- of-no-hindrance (Vaikuṇṭha), the place where there is no fear. The chariot represents the body with all its powers of action, drawn by the horses of the senses and directed by the mind as charioteer. The Self is the rider. From it one shoots the arrows of the senses at their respective objects. Every Agamic temple has a temple chariot and every year during the annual Brahmotsava which last for 10 days, the utsava mūrti (proxy images) are taken out for a ride in the chariot. This mudra indicates that we should never entertain feelings of fear vis-à-vis God. 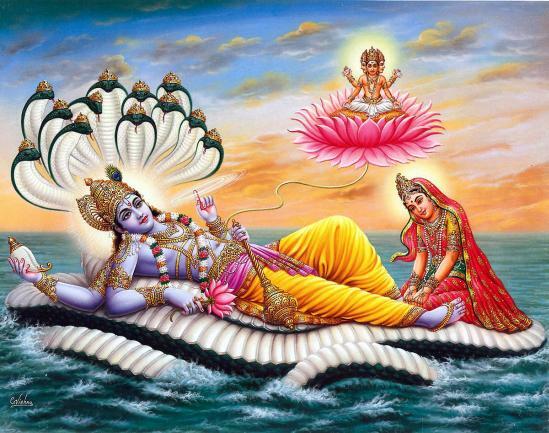 Vishnu/Nārāyaṇa is the ocean of compassion and perfect justice and thus there is nothing to fear from Him. It also reminds us that we should never be the cause of fear to any other living being. Fear is the first obstacle in the path of spiritual development. This mudra indicates that God is the personification of generosity — He showers grace and mercy on all alike without requiring anything in return. It also serves to remind us to cultivate the practice of generosity in our own lives and to always be the source of happiness to other sentient beings. This mudra indicates that God is the Supreme Guru and repeatedly takes birth in order to teach us the Dharma. In the Incarnation of Krishna he taught the Bhagavad Gītā. This mudra is displayed by the guardian deities of the sanctum and serves to remind us to be restrained and to exercise respect and caution when entering into a sacred precinct. This mudra is indicates that surrender to the feet of the God will bring about liberation from Samsāra — the cycle of birth and death. All Hindu deities are either standing or sitting on Lotus Thrones. The lotus is the symbol of the enlightened mind hence indicating that the Gods are all fully manifested in the minds of the enlightened ones. When we meditate upon Vishnu we visualize a lotus within the heart and upon that pure unsullied lotus we visualize Lord Vishnu in all his glory bedecked in all his paraphernalia. The Kīrti-mukha usually forms part of an ornamental doorway in which the deity stands or sits. Above the icon we usually find the “Face-of-Glory” or Kīrti-mukha. T his represents Rāhu — the demon of time that is constantly trying to swallow the sun and moon, and in doing so causes eclipses. The philosophical significance is to remind us of the impermanence and unsubstantiality of all manifested things — and to discourage us from excessive attachment to things and concepts. All names (nāma) and forms (rūpa) are subjected to appearance and disappearance, everything in the universe is ephemeral and unsubstantial. It’s mocking expression serves to remind us that nothing that we take seriously is so in the broader picture.